From 19th – 25th May it is National Watercress week. The recipe below is a perfect watercress recipe that can be served as main course or a starter. Pre-heat the oven to 180C, 350F. Line a Swiss roll tin using parchment or non stick baking paper. Set aside. Using a large mixing bowl, mix sliced spring onions, egg yolks, chopped peppers, milk, gruyere, salt, and pepper. Using a separate large mixing bowl, whisk the egg whites until stiff. Next, fold a third of the egg whites into the egg yolk mixture. Add the remaining egg whites and fold using knife or spatula. Put the mixture on the tin and bake for 20 minutes. Set. Remove from the tin and set to one side to cool. Using an electric whisk or wooden spoon, blend the cream cheese, goats cheese, and ground black pepper. Spread the mixture on top of the cold roulade. 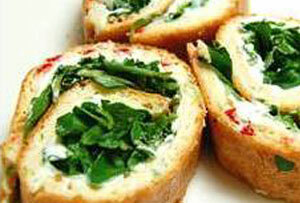 Scatter the watercress leaves on the cheese and roll it up from the long side.